Ticket sales have opened for the Sydney Brick Show 2015. The Sydney Brick Show is returning to Town Hall for 2015 – which is a much better venue in my view. In a new two-day format over 18–19 April 2015 they “bring you our largest experience yet with over 2,500 sqm of LEGO® displays by fans from across Australia”. Tickets are $12 for adults, $7 for 2-16 year-olds and, $35 for a family of four. They are available now through Ticketmaster. If you are particularly enthusiastic, you can also buy a t-shirt. The t-shirts will be only available pre-sale up until six weeks prior and available for collection as you arrive at the show. Available in a wide range of sizes for kids, mens and womens styles. There’s also, as usual, a LEGO building competition. 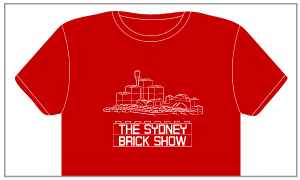 All the details are on the Sydney Brick Show site.